Form for guests to attend SA Prom. Please click the link for the announcement in regards to the new Saint Albert Catholic Schools leadership team. As our school year is quickly coming to a time to celebrate the end of the year, it is time I announce another end. At the end of this year, I will be finishing my 23rd year here at Saint Albert, which will complete my time here. Beginning in July, I will be working at Saint Philip Neri, in Omaha. Since joining Saint Albert in 1995, I am proud to have been a part of the accomplishments Saint Albert has made throughout these 23 years. I am thankful to the staff that have worked with me through the years at the building on 9th Avenue; through building the new elementary and childcare center and thankful for their wonderful time and commitment to Saint Albert while I have been here. 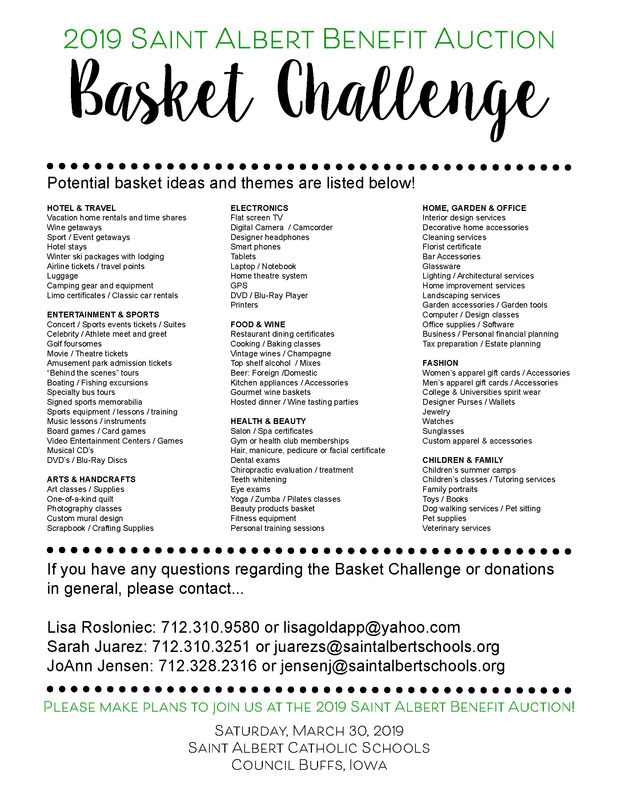 While I am preparing to complete my time here at Saint Albert, I look forward to seeing all of you in the community and here while we celebrate the 2018-2019 school year. Saint Albert Catholic Schools are tremendously grateful for the outpouring of support by our community at the successful Benefit Auction “Past, Present & Future” on March 30. More than half a million dollars — $505,022 to be exact — was raised to continue our strong tradition of providing a top-notch education in a faith-filled environment. This amounts to a net of about $350,000 to be contributed to the school for programs. More than 610 people attended the event set up and coordinated by 115 volunteers led by chair-couple Tommy and Alissa Hughes. We are appreciative of the many hours Tommy and Alissa put into organizing the event. “The Saint Albert community and alumni made a statement. We are thankful for the opportunity to offer Catholic education to our children and families and will work hard to preserve the tradition. The overwhelming gratitude we felt is beyond rewarding” said Hughes. We are indebted to Paul Cox, who has dedicated the last 13 years to helping us with the finances of the benefit auction. A third of the funds raised came from a highly successful live auction. In addition, approximately $61,000 was donated during the Raise the Paddle with proceeds going to Saint Albert’s award-winning Science, Technology, Religion, Engineering, Art, and Math (STREAM) Program. The STREAM funding is in memory of Jill White, a longtime Saint. Albert Athletic Trainer and mother of Carter (class of 2022) and Bailey (class of 2019). Congratulations to the Harley Davidson winner Howard Seldin, Jeep Wrangler winner Heidi Christiansen and Mike & Toni Geier winners of the Freddie Falcon Award for service to the Saint Albert community. Also supportive of the benefit auction were the many businesses, leaders, Saint Albert families and alumni who provided the items that were auctioned. Thank you to our major sponsors: Omaha Car Stop / Gorilla Car Wash; Hy-Vee; Cutler-O’Neill-Meyer-Woodring Funeral Home & Crematory; Kelly’s Carpet Omaha; Doll Distributing; EPCO; PWC Enterprises; and Mouw Chiropractic. Please see this letter from Bishop Pates, released April 3, 2019. “Deacon Dobelmann brings a full range of experience in Catholic education. He will bring strong Catholic identity to St. Albert, and inspire the staff to work on continuous improvement to pursue academic excellence and Catholic formation.” Said Dr. Tracy Bonday. Deacon Dobelmann said he is excited to come to Council Bluffs. “Having a strong and vibrant Catholic identity is essential for St. Albert’s. We can never lose focus that everything we do is centered on Jesus Christ and the Good News of Salvation,” he said. 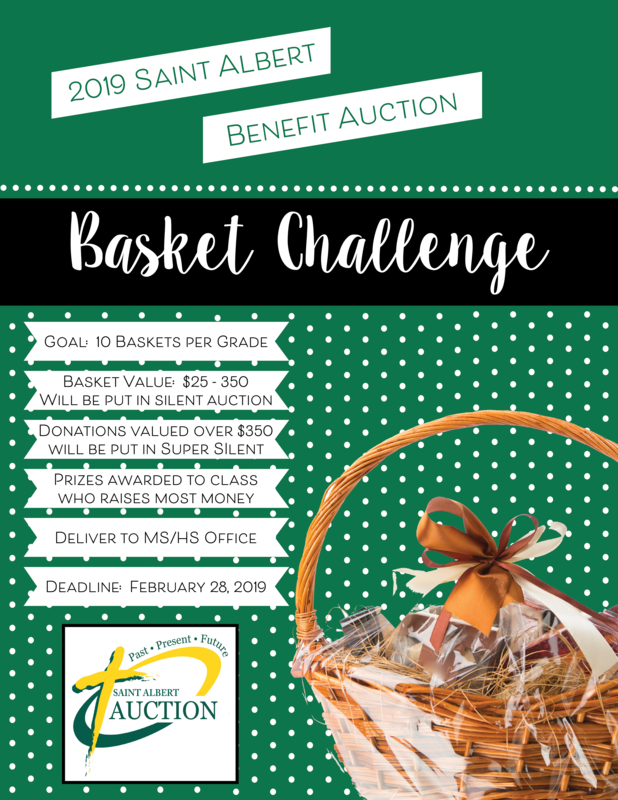 Click here to begin browsing the items for the Benefit Auction, which is Saturday night, March 30, 2019! A few seats are left…purchase them today! Saint Albert Catholic Schools have named Larry Peterson as the Head Boys Basketball Coach. This announcement follows recent player, parent, and coaches meetings. These groups stressed the priorities of valuing the young men on the team, improving relationships and communication, and successfully leading the basketball program through a successful season. Current assistant coaches Alex Martinez and Mike Kavars will continue to serve in their roles and their responsibilities will expand to support Coach Peterson. Clearly, competing successfully will require support and input from the entire coaching staff, and Coach Peterson encourages and expects their active involvement as the teams prepare, practice, and compete. Kevin White has accepted Coach Peterson’s invitation to lead the freshmen program with the continued support of Tucker Culjat. It’s a compliment to Coach Peterson that he had a thoughtful plan for the continued success of the freshmen boys program. It was important to Saint Albert administration and the basketball community that the program maintains continuity and builds upon the strong relationships of the current coaching staff. It’s essential that the players, parents, and school community feel connected to the coaching staff. Player and parent input made it clear that the players trust these coaches, and these coaches are committed to the players’ success. Coach Peterson and the coaching staff will be communicating with parents and players to share necessary information and updates. With tonight’s games against Creston postponed, the boys next opportunity to compete is Saturday, January 19, 2019 at 4:30 p.m., in the Nebraska Classic at DJ Sokol Arena. We thank the boys basketball team, families and our coaches as we transition forward.